An announcement last week by LUKoil’s number-2 executive and shareholder, Leonid Fedun (see image), that the Russian oil producer expects to find more crude oil in Africa than in Russia was intended to set off alarms bells at the Ministry of Finance in Moscow. That is where Fedun is negotiating for tax concessions for his company’s newly developed oilfields in the Russian sector of the Caspian Sea and in western Siberia. Company sources admit there was nothing new about the African projects in what Fedun had to say. Whether the Finance Ministry intends to offer tax benefits to temper LUKoil’s African enthusiasm remains to be seen. And for the time being, West African spending represents a small fraction – maybe less than a tenth – of LUKoil’s global exploration budget. LUKoil has confirmed that at an industry presentation on September 8, Fedun said that LUKoil may find more potential petroleum in West Africa than in West Siberia, Russia’s biggest production region. “We will conduct unprecedented geological exploration in the next two years, drilling up to 13 wells,” he said. On present well-drilling costs in the region of $60 million each, Fedun appears to be promising to spend $780 million in Ghana and Ivory Coast. But noone can be found at LUKoil to support that estimated number. LUKoil is a publicly listed international, and the second largest oil producer and exporter in Russia (after state-owned Rosneft). Its controlling shareholders are Fedun and chief executive, Vagit Alekperov. The company’s current market capitalization is $45.8 billion, making it the fourth most valuable enterprise in Russia. In February of this year, LUKoil announced that it had made “a quite significant” discovery of gas and light oil while drilling at the Dzata-1 field of the Cape Three Points bloc, in the Gulf of Guinea. In addition to LUKoil, the exploration project partners are Vanco Energy of Texas and the Ghana National Petroleum Corporation.That well cost $60 million to drill. In the most recent presentation Kuzyaev made on the international upstream for LUKoil, he confirms that to date, proven reserves for LUKoil’s projects outside Russia amount to just 8.6% of the company’s total, while output at its international wells is dwarfed by its Russian production – international production in 2009 came to just 5.3% of the aggregate, and was lifted almost entirely from three oilfields in Kazakhstan, with a small flow in Egypt. A LUKoil spokesman did not respond to a request for a breakdown of LUKoil’s recent and planned expenditures at prospects off the coasts of Ghana and Cote d’Ivoire. The company’s report for 2009 says the company – with a 57% stake in the Ghana project – had drilled to the 4,175-metre mark and “penetrated a 94-metre column of hydrocarbon saturation containing a multi-deposit oil and gas accumulation with effective capacity of 25 metres.” Reserve estimation is now under way. 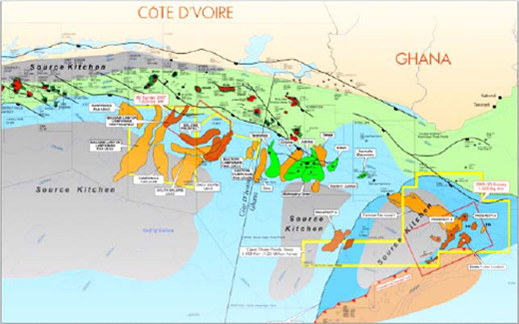 In the Cote d’Ivoire project three “promising geological targets” have been mapped, according to the annual report, and prepared for drilling. Company-wide and worldwide, LUKoil reported that in 2009 it reduced its exploration expenses by $269 million, compared to the 2008 level. The totals were $394 million and $679 million, respectively. The document reports “first-phase” costs in Ghana for 2009 at $30 million – that’s less than 8% of the exploration budget as a whole. Kuzyaev’s presentation for LUKoil Overseas Holding calls West Africa the “supreme” reserve find for the company, but until the numbers come in, LUKoil reports suggests it is expecting much bigger results from its exploration in Iraq, Saudi Arabia, and South America. So what was Fedun’s reason for the promoting the notion that LUKoil has found more oil in Ghana and Cote d’Ivoire than in western Siberia? In mid-July, the Moscow industry press reported that LUKoil had applied to the Finance Ministry for a tax holiday to cover its brand-new Korchagin oilfield in the Caspian, and for other fields being developed to production nearby. The company application was for zero export duty on the oil it plans to lift and ship from Korchagin. This would be worth at least $400 million, if granted. And that’s the rub. LUKoil is competing against Rosneft and other Russian crude oil exporters for relief of the export duty on new fields. The others who have already benefited from zero export duty since January are producing at new fields in eastern Siberia; they are shipping eastwards to the Asian market, through a pipe and rail link to China; and through the new Pacific Ocean tanker terminal at Kozmino Bay. LUKoil wants the benefit to apply with equality over the entire oil geography of Russia. The Finance Ministry wants to eliminate or reduce the tax benefit to the oil companies so as to cover rising budget outlays demanded by the approaching national election campaigns. 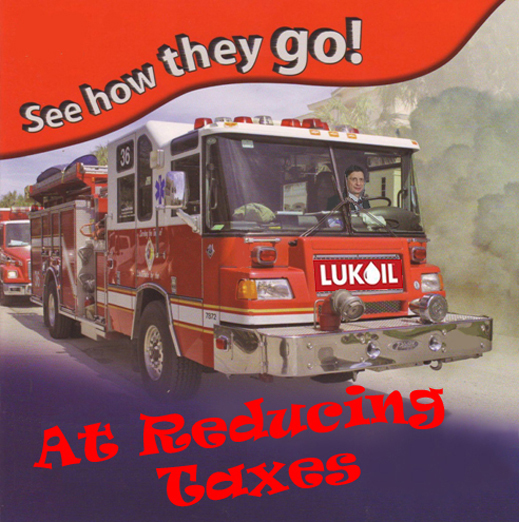 LUKoil’s response is Fedun’s – make our new Russian wells more profitable, or else we’ll drill elsewhere.